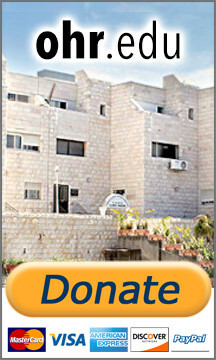 The outstanding success which has blessed Ohr Somayach's efforts in Yerushalayim, Toronto, London, Johannesburg and Sydney, and the impact which our work has had on countless campuses, communities and individuals throughout the world, is certainly something for which we must constantly offer thanks to Heaven. As you are well aware, this success has been the result of overcoming, with Heaven's help, so many obstacles on the way to reaching our goal. In a material sense the challenge of securing funds for the maintenance and expansion of our wide range of programs has become a very serious issue in light of the current economic situation. Add to this the urgent need to secure and expand physical facilities to more efficiently accommodate the ever-growing number of people seeking our help. The proper hashkafa for facing such challenges can be learned from what happened at the akeida right after Avraham Avinu was commanded to desist from slaughtering his son. "Then Avraham looked up and saw behind him a ram caught in the thicket by his horns." How did Avraham, without a direct command, know that this ram was intended to serve as a korban in place of Yitzchak? Aggadic tradition has it that Satan attempted to prevent the ram from approaching Avraham by getting its horns stuck in the thicket of the surrounding trees. When Avraham saw this obstacle being placed before him by the very same Satan who had persistently tried to dissuade him from offering his son, he realized that this was a sign from Heaven that this ram was to be a korban. When we face difficulties such as the paying of salaries on time, or realize that we cannot afford to continue or expand particular programs, we must view these crises as "ram horns caught in the thicket." While we consistently pray for Heavenly help in surviving this crisis, we also look towards our alumni, our traditional supporters, and every Jew who cares, to help us "take the ram out of the thickets" and continue our sacred efforts.